During a Nepalese cooking demonstration earlier this year, we were welcomed with a fascinating video about an aspect of Nepalese culture of which many had never heard. I thought it was worth sharing here. Nepal is full of deities. One is Kumari, the living Goddess, and incarnation of the Goddess Taleju, who has been worshipped by both Hindi and Buddhists since the seventeenth century. Eligible girls are chosen from the Shakaya clan of the Newari community, in a process similar to that used in Tibet to choose the Dalai Lama. 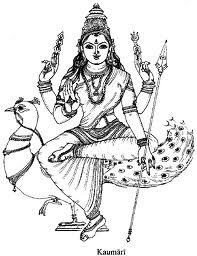 The word Kumari derived from Sanskrit Kaumarya meaning virgin. Virgin worship has been popular for over two thousand years on the Indian subcontinent, bound up in many different legends and traditions. In Nepal, Kumari candidates are aged between two and four years old. They must be healthy and without blemish. Girls who fulfill the eligibility requirements are examined for the thirty-two perfections of a goddess, known as the battis lakshanas. These include having a neck like a conch shell, a body like a banyan tree, eyelashes like a cow… and a voice as soft and clear as a duck’s. A Kumari candidate must also be serene and fearless. Apparently one of the final tests involves spending a night alone with the heads of the sacrificial goats and buffalos without showing fear. When the perfect little girl is finally chosen she is ritually cleansed and purified, so that Taleju may enter her and she can be reborn as the Living Goddess. She will remain a Kumari until her first menstruation. Her natural father becomes the guardian of Kumari and he takes charge of all rituals. The first ritual is to prepare her for being presented to the people. After the cleansing, the new goddess is dressed in red, and draped in jewelry believed to have Divine Powers. 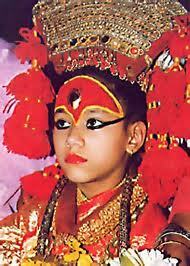 The agni chakchuu or “fire eye” is painted on her forehead, a symbol of her special powers of perception. From now on she must behave at all times as befits a goddess. Leaving the Taleju temple, the young Kumari crosses the square on a white cloth to Kumari Ghar, her home for the duration of her divinity. This is the last time her feet touch the ground, and she only leaves the palace now for ceremonial occasions, carried by her mother or transported in her golden palanquin. Kumari confers her blessings with marigold petals, as worshippers kneel to touch her feet. Even a glimpse of her is believed to bring good fortune. These days there is some controversy about the Kumari. Some claim that the lives these girls are forced to live is a form of child abuse, and there have been accusations that many Kumari are emotionally damaged when they finally emerge from the temple.We saw an older woman, once Kumari, who still believes herself to be holy and spends her days in the same way she did while she was the Living Goddess. Officially possessed by the Goddess, Kumari is not allowed to talk to anyone, and, confined to the Temple, she seldom appears in public. This isolates her, not only from the outside world but from her family. In the past Kumari received no education as she was widely considered to be omniscient. Today she is tutored, but even then she must be treated as a deity. Everyone who comes into contact with her, even her parents, must be deferential and her every request must be granted. When she finally returns to her family in adolescence, it can be hard for her to adapt to normal life: to walk again, and even to talk to her family. After years of being idolized, she is often neglected and ostracized. Popular superstition even suggests that a man who marries a Kumari is doomed to die within six months. Yet despite the critics, Kumari is still respected and venerated as the Living Goddess by those Nepalese striving to maintain the old beliefs. During the Indra Jatra festival, held in Kathamandu each September, Kumari is robed and decorated and carried in her palanquin through the city streets, where thousands come to catch a glimpse of the Living Goddess and seek her blessings. *as published in ADBSA Newsflash, September 2011, and with thanks to Google images for the pictures. 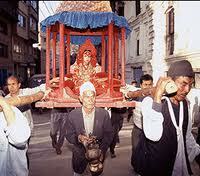 This entry was posted in Nepal, Travel and tagged Goddess, Kathmandu, Kumari, Nepal, Newari, Taleju. Bookmark the permalink.